I picked this book up and finished it back in April, and my love for this book has grown even more since then. I thought that by taking sometime to write a review I could formulate some sort of response good enough for this well deserving book. I have come up with even more possibilities as to why this book is truly one that deserves to be read. So really the time has just made it even more difficult to review, but I will try to do this book justice. This book is so deserving of a 5 in every aspect. From the beginning pages of this book we are thrown into a chaotic world. A world full of division on both side of a wall. Tartarus, is the area that is ruled by tribes. Each tribe views the way of life a little differently then the next tribe. I think that was what I liked the most about this book. Seeing and experiencing all the different tribes through the eyes of the main characters. Wilson does an outstanding job on describing each tribe, each one growing even more fearful then the last. What also does the tribes even more justice is the artwork of them at the beginning of the book. 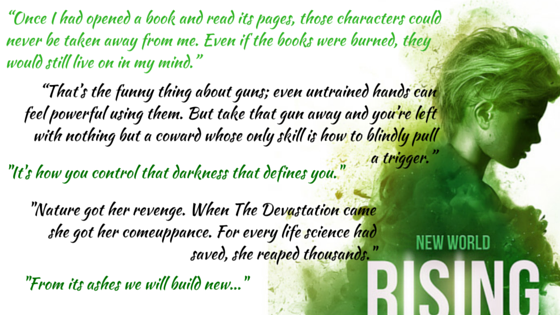 The imagery involved vastly allows for readers to get fully submersed in this world and grow to love every aspect. My final remark about the overall story is my love for the ending. Now I wouldn't say that it ended on a cliff hanger, however, it most certainly kind of did. It, however is not the type of cliff hanger that leaves you hating the author for doing this to you, but rather loving her even more because the possibilities are endless. It was the type of cliffhanger that made me heavily contemplate what could happen next and what could go wrong or right. All in all, if you are a lover of dystopian novels, this book should be right up your alley. The setting and display of the world was neatly placed, and well planned to the point of this place physically being real inside my mind. The characters and the bonds each formed were unbreakable, until they became broken. 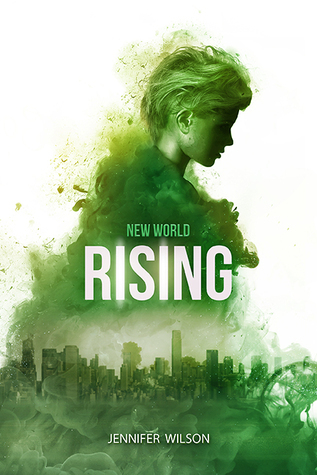 Everything about New World Rising is something that can be loved. I highly recommend this book, and I can't wait to see where New World Ashes takes us.